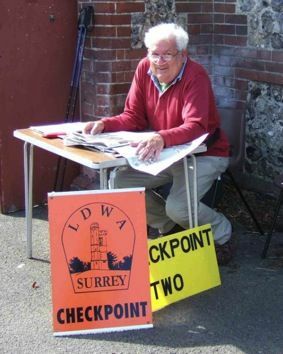 The funeral of Reg Chapman will take place at 1pm on Wednesday 17th November at Guildford Crematorium, New Pond Road, Godalming, Surrey GU7 3DB. Friends from the LDWA are most welcome. Afterwards all are invited to join the family at Worplesdon Place Hotel, Perry Hill Worplesdon, Guildford GU3 3RY. Reg was the LDWA's Internet Officer and Webmaster, and did a great deal for the LDWA both nationally and locally over many years. In lieu of flowers, donations to the British Lung Foundation would be appreciated. Please send cheques to: Ford Mears & Partners - Funeral Directors, 26 Frimley High Street, Frimley, Surrey GU16 7JD.